The Mystery was published in issue # 5 of Dark Matter: Women Witnessing, edited and published by Lise Weil. “Accepting that direct communication and analysis came from the Elephant People allowed the field we were in together to become visible. We realized that we had been in ‘spirits’ theater for seventeen years, simultaneously actors and audience. Neither Elephant nor human could have designed such situations in which members of both species appear to each other as if explicitly summoned. While our meetings were both intentional and circumstantial, the sum total of our many interactions over time, hours, days, weeks, years, cohered in nested living stories that became the language through which we, different species though we are, spoke to each other. This occurred both within and outside of time and space. We had been transported to another dimension where meaning and action are simultaneous and indistinguishable. The story that emerged from and enfolded us challenged all conventional assumptions of reality and hegemony. We had returned to the Elephants, again and again, at the behest of the Ambassador, and in return we were allowed to participate in a common field of consciousness that manifested unpredictably. Clearly both human and non-human were impacted by each other. Attuned to one another, we began to share a critical DNA of mind from which future connections and understandings would emerge. That is, we melted toward each other and, ultimately, without changing shape, we melted into each other…. This is a response to the darkest times. We know all life is threatened, and increasingly so under the current administration, yet we inevitably respond from our human perspectives and fears. However, we will not understand what we must without recognizing non-human wisdom. In 2010, several of us had dreams indicating that there are hidden passageways, different for each of us, to saving the earth and restoring the natural world. 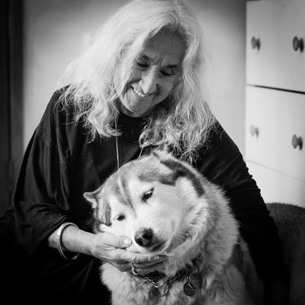 For me, making alliances with animals and other non-human beings became an essential path. In 1997, as co-editor of the groundbreaking anthology, Intimate Nature: The Bond Between Women and Animals, which testified to animal intelligence and agency, I was introduced to one of the great mysteries: the true nature of the beings with whom we cohabit the planet which I could only begin to understand by stepping out of my own mind into the consciousness of others. As many of you reading this know, I met an Elephant we call the Ambassador on Epiphany, January 6th, 2000, in Chobe National Park, Botswana. 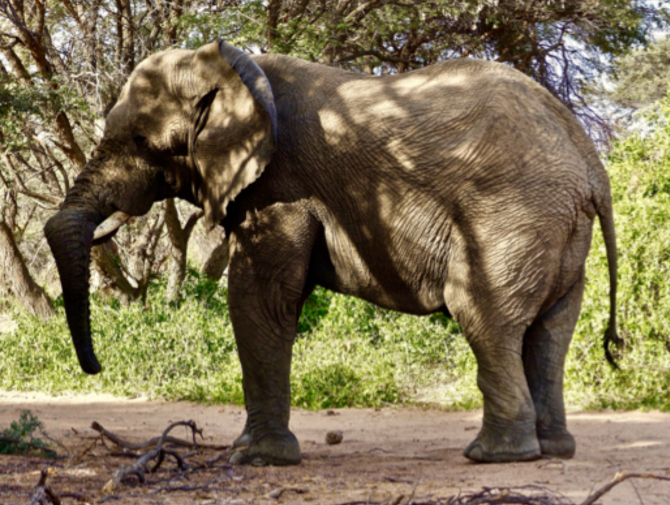 Traveling to various African wild animal reserves over the next seventeen years, I realized I was engaging with different Elephants and herds while fulfilling the mandate implicit in the original meeting to regard the Elephants as kin. A few years ago, I was alerted to Elephants in Assam, India occupying an airstrip to prevent military planes taking off and landing. There were also a series of attacks on humans in India and around the globe that seemed to avenge earlier assaults on Elephants, interruption or prevention of mourning rituals, and loss of habitat. It seemed like a global organized activity on the part of the Elephants and I was able to speak of Elephant sovereignty in an article translated into Hindi and circulated in Indian papers. 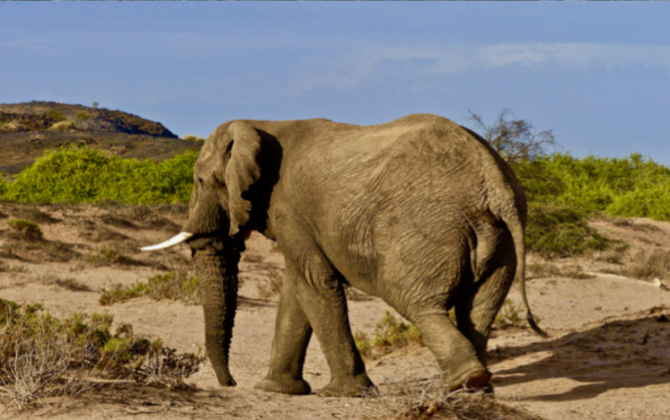 Very recently, a female Elephant in Hwange killed a big game hunter who was tracking her and her herd. A great white Shark leaped into a fisherman’s boat in Australian waters and a Bear attacked a hunter in Ontario Canada. Regarded as random, these incidents can be understood as conscious non-human responses to intolerable human activities. Animals have a capacity for outrage and retribution as well as surprise and wonder. Once it’s accepted that non-human species have agency and spiritual lives, the world changes and we recognize, against all assumptions, who these others really are. In the early sixties, a black Panther escaped Jungleland in Thousand Oaks, California. Then a lion escaped from a Midwest zoo and children were bussed to view the hunt. Instinctively, I identified with the animals, imagined what it might feel to be lost and hunted in suburbia and wrote a novel, What Rough Beast, (unpublished) from a Lion’s point of view. I entered into his consciousness, his view of being imprisoned, then hunted, and his thoughts about the nature of human beings. Looking back at my life fifty years later, I see a thread, a calling to bear witness to and speak of the true nature of the non-human beings with whom we share the planet and Creation. January 2017. I returned to Africa for the ninth time to be with the Elephants, holding different questions and marveling at the unpredictable ways they had been addressed by events Cynthia Travis, Matt Meyer, our guide, and I traveled first to Thula Thula, the South African reserve started by Lawrence Anthony, author of The Elephant Whisperer, and then to Chobe where a group of Elephants gathered around us, seemingly out of the blue, at 5 pm on Epiphany, just as the Ambassador had appeared on Epiphany 2000, and then walked back into the forest exactly at 6 pm when we had to leave the park. Such meetings constitute the ways the Elephants have been conversing with us over time and space. Sequences of events are a language through which we communicate across species–no translation needed. On January 9th we arrived at Mashatu in Southern Botswana and on January 14th in Damaraland, Namibia. Given that this might very well be a last visit, it was time to approach all the trips and encounters as a single Story, which viewed as such could provide new insights and guidance for human connections to the wild. I was calling on memory – a very Elephant way of being – in order to see the entire pattern of our relating to each other and what arises from that integrated perspective. Alert to the subtlest possible transmission, still I could not distinguish between the Elephants’ intent and Spirits’ objective. Back at home, I could not speak of the journey. 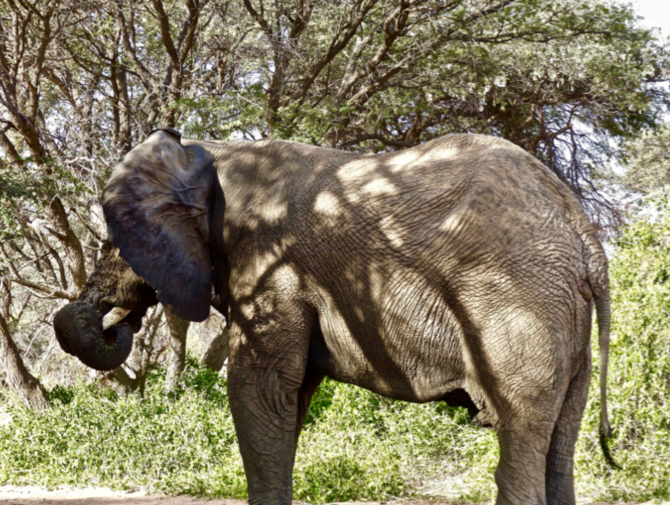 Then I wrote about Thula Thula and Chobe – humans and Elephants communicating with each other about drought (see link above). When Frankie the up-and-coming Matriarch of Thula Thula reproached me and our species for creating drought and bringing misery and death to her people, she was engaging in a direct, grave and strategic transmission. Too often people speak of the Animals’ inviolable love for us. It eases the human heart to think so. But I wouldn’t console myself with the illusion that this communication was tempered by love. There was more behind it: Humans must change. How? Think with the heart as Indigenous people do. Think ‘we’ instead of ‘I’. Become more Elephant. Become less of what we are and more of the Indigenous and non-human that we have attacked and violated. Become like they are – earth-centered, spirit- centered, relational beings who would never hunt the way we hunt, kill the way we kill, destroy the way we destroy. Yes. These are good beginnings. It takes years to step across the species divide and to recognize different species as peers and equals on this planet. It shatters the mind – as it should. It requires undoing the pervasive structures, apparent and subtle, of the dominating, imperial human cultures that have assaulted Indigenous wisdom and what remains of the true nature of the world. The future existence of the planet depends on creating honest working alliances with all the myriad sentient, intelligent non-human beings. 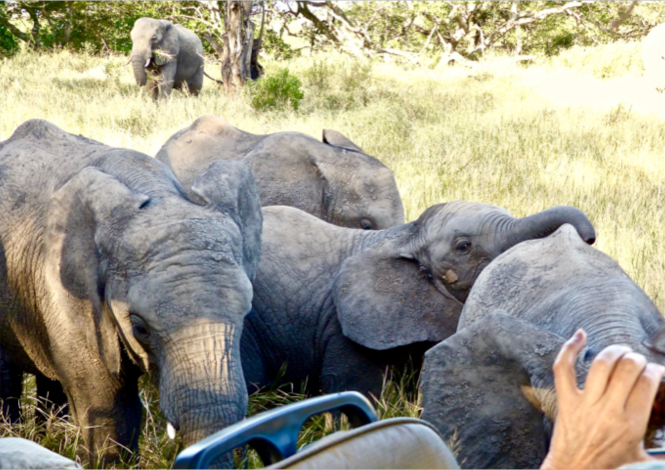 Each meeting with the Elephants had been a gift and a mandate leading us to this understanding. However, the gift of such extraordinary meetings cannot be received without knowing the gravity of extinction, pollution and climate change we have created and without finding ways to heal what we have wrought. 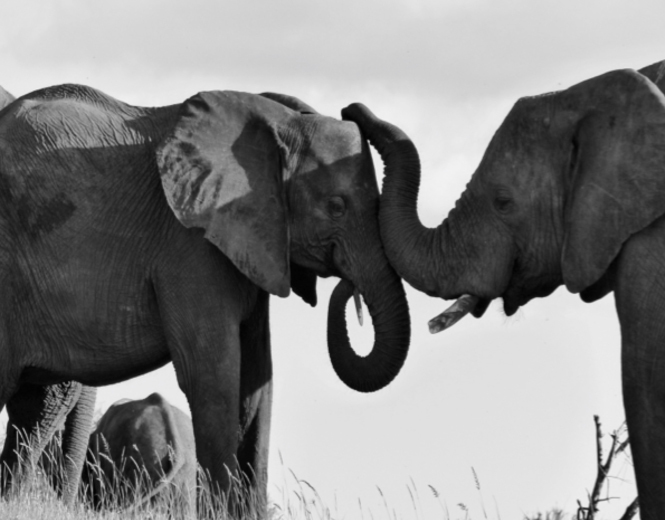 The animals, the Elephants, are aware of our criminal activities and are responding. Integrity requires us to change our ways and minds. This is what they are indicating when they come to meet us. 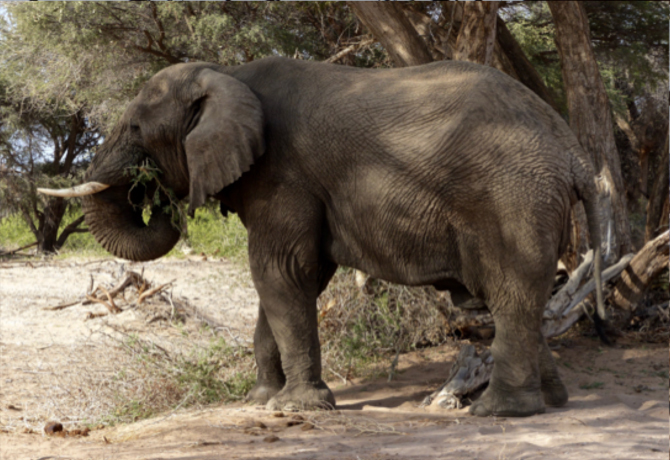 Mashatu Game Reserve consists of 72,000 acres located in the Northern Tuli Game Reserve of Botswana, situated between the Tuli Safari Area, a national park in Zimbabwe and the Mapungubwe National Park, a World Heritage Site in South Africa. 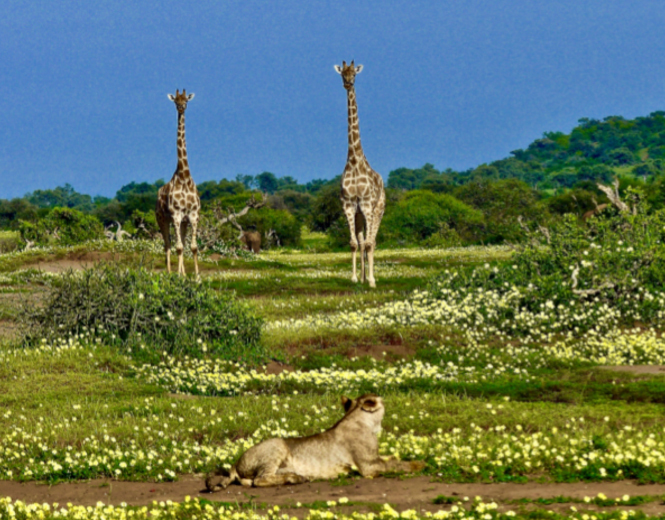 As it shares unfenced borders with both the South African and Zimbabwean national parks in the south and north respectively, the animals have a vast area, a long wildlife corridor, to wander through. However, as they are know they are safe within Botswana where hunting is illegal and threatened in Zimbabwe where trophy hunting is encouraged, many animals, if food allows it, avoid crossing into Zimbabwe. Arriving at Mashatu, we knew we would not experience the intimacy with the animals that we felt with the single herd of Elephants on the 3,000 acres of Thula Thula nor the sense of destiny that came with multiple encounters with Elephants on six different occasions at five in the afternoon at the Chapungu tree in Chobe National Park. On the last day in Mashatu in 2016, we had been allowed to approach a large herd at a water hole. They departed just at the time we had to repair to an elevated place for a last cup of tea before going to the airport. 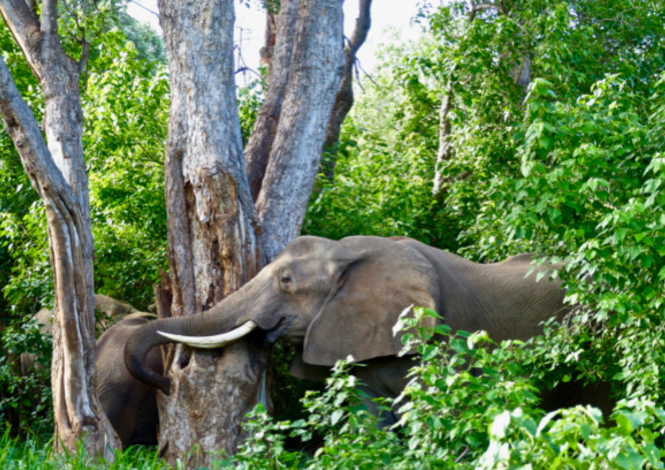 We were stunned when the herd, split into several lines, approached the Mashatu tree so closely we took cover in the truck. But undeniably, they had come to say good-bye. Now we were returning a year later. 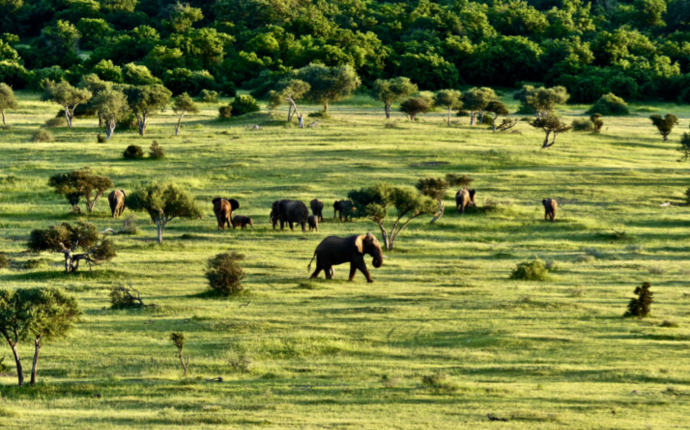 The one desire I had had to listen from within a herd and to greet the Matriarchs formally had been met in Thula Thula and was unlikely again with such a large Elephant population. Earlier, our time in Chobe had confirmed the magical connections we had had there over the years. We accepted that we had been incorporated into a field of co-existence that made communication possible. Now I wondered what insights or messages might come from our next two destinations? In a dry country, rain is luck. Abundant rains had come to Mashatu and were continuing. A pulley system helped us cross a swollen river where the year before we had driven across a dry ravine. Within minutes of going out on a first game drive, the winds picked up and we stopped the Land Rover to put ponchos on before the downpour. In an open vehicle without a roof we were as exposed to the elements as the animals. It was a good beginning. 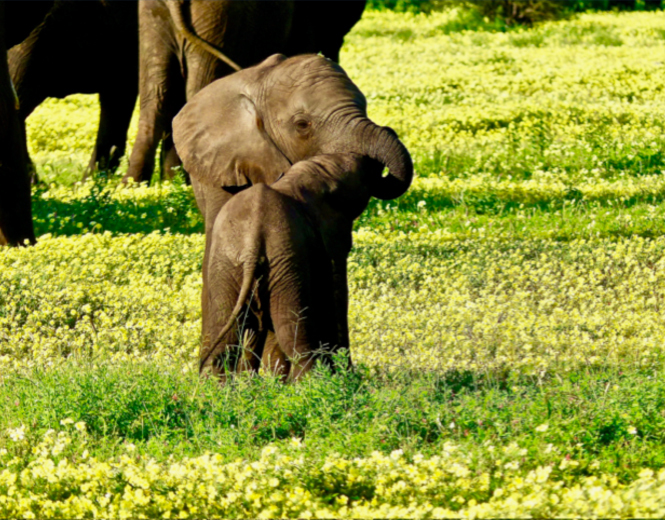 The rain accompanied us intermittently until sunset as we drove across darkened and then brilliant yellow fields of devil’s thorn with which the female Elephants adorned themselves. Accepting that we were not at Mashatu to repeat earlier experiences, confirm previous perceptions or gather new proofs of connection, we tried to look at everything with fresh eyes. It was Cyndie who first noticed the gestures of a herd of Elephants moving with great deliberation and intent into a small grove. We followed them curious. There they divided into little groups leaning against the trees, caressing them with their trunks but not eating the leaves. It can be nothing less than devotion, Cyndie said. We had not expected to come upon Elephants in prayer. But… why not? Returning to the grove several times, we never encountered the Elephants there again. How empty it seemed without their presence converting it into a temple. Although we didn’t see them in prayer, we did come upon them blessing each other. Beautiful and awesome as this was, I didn’t initially grasp what was being revealed. Anticipating relationship with the Elephants, or continuously hoping for it, I wasn’t aware of what was, in fact, occurring. In retrospect, stepping out of the confinement and limitation of individual events and examining them within a progression over years, writing this piece, seeing the photos again, I understand what I couldn’t then. We were shown perfect beauty. We were shown … Creation. We were shown the spiritual lives of the Elephants and the animals. We were shown that we had been born into Paradise and had been exiled by our own hands. Within minutes of driving out of the Camp the first morning, we were astonished by two turtle doves making love on a tree branch. A wondrous instance on a brilliant morning. Several minutes later, we came upon a terrapin in the road and our guide following his intuition looked into the underbrush about twenty feet away where two terrapins were mating. Spirit was getting our attention. 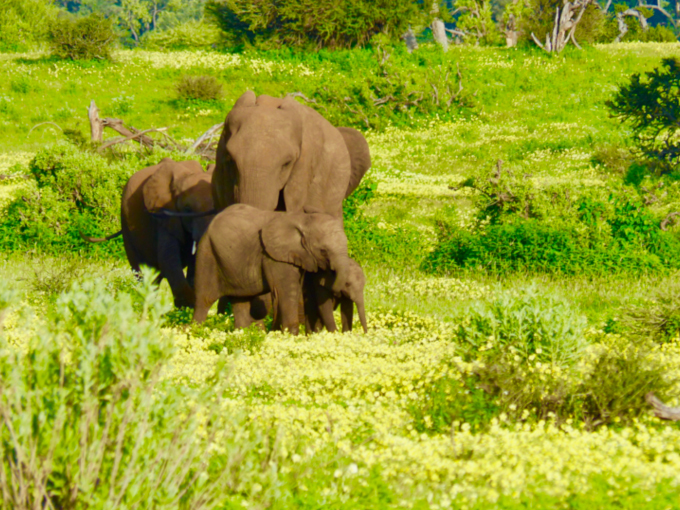 For the rest of the days at Mashatu we marveled at the profusion of life forms. There were newborn and young — Elephant, kudu, impala, zebra, wildebeest, cape buffalo, monkey, baboon, lion, giraffe … — everywhere. 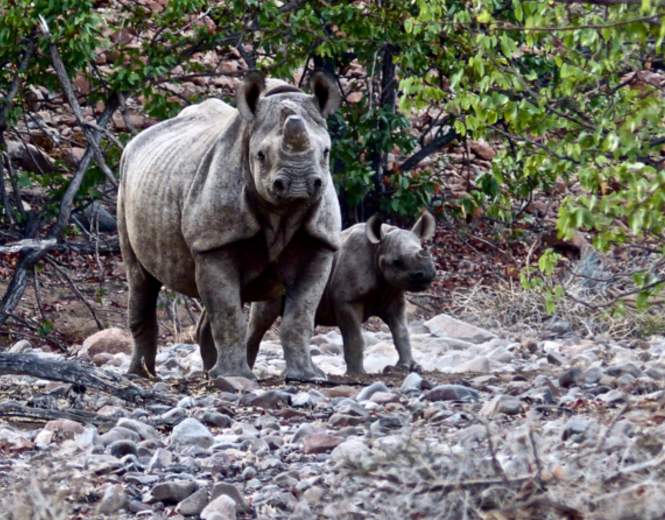 And in Namibia, where we were to go next, even rhino calves. As if to emphasize the message of fertility, everyone was mating. So it wasn’t a great surprise when we came upon an alpha lion we had seen the day before, sleeping under a tree while ten feet away, a young lioness, stirred restlessly. Unable to control her inner agitation, she approached the lion, circled him, prodded him until he stopped resisting her. What struck us was his kindness. Our guide indicated that she was immature, had never had cubs, was overwhelmed with estrus. While the lion entered her, almost as if bidden, he did so gently, lowering his mouth to her shoulder to ease her before his thrust. This sequence repeated again and again. The last hour of the last day at Mashatu, we found a perch at the summit of a small hill that allowed us to look back toward the plain where we had been present as a great bull Elephant had been courting an Elephant matriarch before the entire herd. Then a startling shriek from a little one who resented the bull’s attention interrupted them and the bull strode away. Behind us to the east, the herd was dispersing for the night. 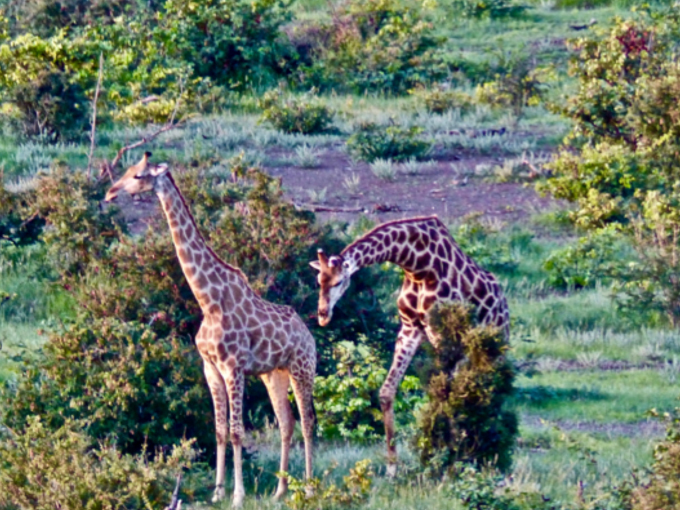 To the north, two Giraffes, their bodies rosy from the setting sun were standing, enchanted. We could see that they wanted each other, though they were very still. Then he arched back in a parabola of desire and in seconds they mated in the purple dusk. It was the last moment of the last day at Mashatu. Then the full moon rose. 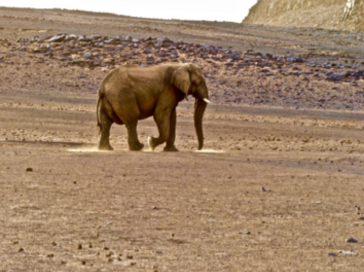 We left the field of vision of fertility and creation for Damaraland in Namib, the oldest desert of the world. 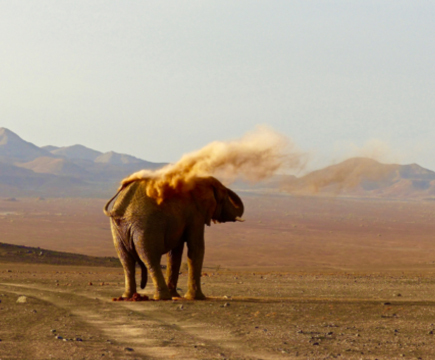 Here desert Elephants having adjusted to the environment and able to go without water for a few day are frequently born without tusks as a rapid genetic response to poaching. 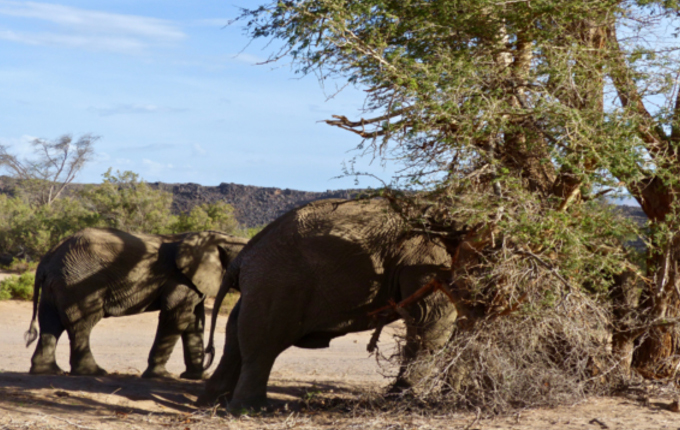 Last year, we saw a tuskless herd in the reserve and this year we were aware of many more tuskless Elephants among the others on the narrow oasis along a sand river where three very small herds sustain themselves. 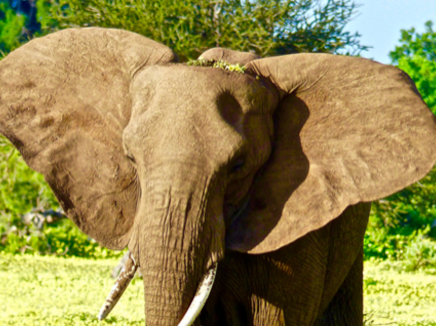 As at Thula Thula, we were able to have some intimacy with the Elephants, following one and then another in their daily life. While we recognized individual conversations or connections as they occurred, it was only afterwards that I saw a pattern that could appropriately be acknowledged as interconnection. We were a small group, they were a small herd – we were with each other as distinct from observing each other. I was hoping to be able to see the Elephants and other species for themselves, independent of my own understanding. Over time, moments cohere into a Story, a field of vision, and it is the human task to see it for itself. Thula Thula had prepared me for Damaraland though I didn’t know it at the time. The continuity of drought was an essential element. The abundance, even extravagance, of life forms at Chobe and Mashatu seemed to deny the grave danger of climate change caused by human activity, the on-going struggle for existence, the conflicts between the herders and the wild as a consequence of the lack of water and resources. In Damaraland, we remembered. The bare but startling beauty of the landscape resembles the moon more than earth, and the Elephants themselves seem to have emerged from the land. In Damaraland as in Thula Thula, it became possible to focus on particular members of the herd. Following their lead when we came upon them, rather than our inclinations, we repeatedly found ourselves in the presence of a great bull Elephant. Only on our return home, at the airport in Frankfurt, did we realize that this great bull had dominated the landscape on the last day we had spent in Damaraland the year before. He had been posed like a sentinel on a rocky incline at the entrance to the lines of trees and desert springs along the sand river. We had stayed with him for almost an hour, mesmerized. This year, the same; whenever he appeared, we gave ourselves up to him. Without acknowledging us, he silently directed us to stay and we did for long periods of time. The first day, we were parked below an earthen bank where a female was feeding on a tree when he appeared and displaced her. Though we remained with him, there was no indication that he was aware of or interested in us. 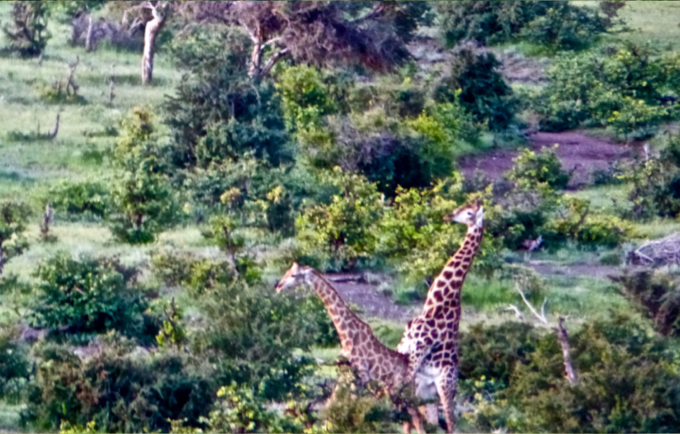 Again in our presence, the second day, he approached two young bulls who were trying to topple a tree. He advanced as an elder, demonstrated the right technique for grazing on trees and leaned against it so as to instruct them properly. When they became rambunctious, he turned abruptly and left. We followed but he went off into the bush. We were finding him an interesting bull Elephant, but on the third day he astounded us. Then we began to consider that something extraordinary was happening and we were, and were not, peripheral to the event. We had spent a good part of the afternoon unsuccessfully tracking desert lions along the small dunes, always slightly behind the new footprints in the sand. Then we turned back to the sand river to look for Elephants. Pausing to determine our next move, we saw the Bull Elephant approach the hillock above us and we turned the truck to watch him. He came slowly and determinedly, tore away some branches and threw them aside as if to extend the space. As was the case seventeen years earlier with the Ambassador, his actions seemed conscious and deliberate. To our astonishment, he then carefully eased his great weight down onto the sand and went to sleep, facing the direction of the lions and allowing his back to us. 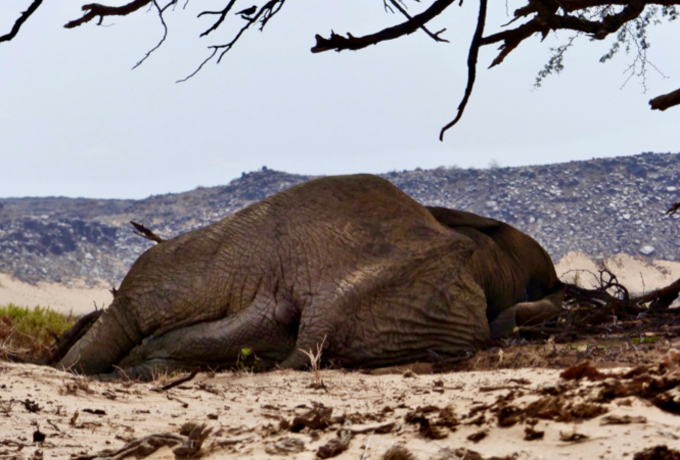 Neither Cyndie, I, nor Matt, who had been Head Ranger and Head Photographic Ranger at the private South African game reserve, Mala Mala, had ever seen an Elephant lie down to sleep. Accepting that direct communication and analysis came from the Elephant People allowed the field we were in together to become visible. We realized that we had been in ‘spirits’ theater for sixteen years, simultaneously actors and audience. Neither Elephant nor human could have designed such situations in which members of both species appear to each other as if explicitly summoned. While our meetings were both intentional and circumstantial, the sum total of our many interactions over time, hours, days, weeks, years, cohered in nested living stories that became the language through which we, different species though we are, spoke to each other. This occurred both within and outside of time and space. We had been transported to another dimension where meaning and action are simultaneous and indistinguishable. The story that emerged from and enfolded us challenged all conventional assumptions of reality and hegemony. We had returned to the Elephants, again and again, at the behest of the Ambassador, and in return we were allowed to participate in a common field of consciousness that manifested unpredictably. Clearly both human and non-human were impacted by each other. Attuned to one another, we began to share a critical DNA of mind from which future connections and understandings would emerge. That is, we melted toward each other and, ultimately, without changing shape, we melted into each other. And so we entered the last day. Toward the end of the afternoon before we would have to leave Damaraland, we again came across the bull whom I began calling The Great Elephant. He was waiting for us in the central island of the sand river. We didn’t know he was waiting for us then, but I know it now. It has taken months to understand this, to see pattern and Story, too often hidden by time and doubt. A deeper understanding, one that encompasses all the years of engagement, beckons. Indigenous people knew this realm, this dimension beyond ours, this field of knowing and being where humans, non-humans, the spirits and earth co-exist beyond relationship. For the next hour or two, we followed him through the valley as he grazed or hid in the brush until he led us to the vast desert plain that all of us would cross at sundown. Just as night was falling, he would be on his way to a water tank set aside for the Elephants in return for the government digging wells for the Native people living there, and we would be returning to the Lodge. Soon after we arrived, he left the tree where he had been waiting, turned east and meandered from place to place. At one point, he stopped, certain that we were watching though not glancing at us, and began to twist his trunk into a strange knot that I recognized as the gesture through which the Ambassador greeted us in 2000. He continued contorting his trunk while we observed, moved and mystified. Finally, he unfolded his trunk, turned and went on. Following him was complex. We had to be rigorous about not leading, finding a vantage point from which we could see without interfering or challenging him. When he stopped by a small tree, we were already directly in his path and he knew it. There were moments when we felt his love for the tree in the manner of the Elephants in Mashatu and we were simultaneously aware of his comedic threat to topple it upon us. Still, we remained quietly. Sometimes when he approached, there was a divide between the Damaraland guide’s experience and training in caution and my own deep conviction that we were safe and needed to yield to the bull’s leadership not our fears. So many minutes passed. It felt like hours or days. Soon he began walking again and we assumed he was leading us out of the valley toward the desert and the mountains. But, unexpectedly, he entered a thicket and virtually disappeared. We waited and waited, agreeing among ourselves that we would wait no more than twenty more minutes. When the time was almost over, he emerged so dramatically he seemed angry to everyone in the truck. Believing we were completely safe, I begged them to be still and not startle him by turning on the engine. I had been speaking to him in my mind, explaining that this was our last night, actually our last hour, and had pleaded with him to come out as a sign or confirmation of the connection we were all feeling. And so, yes, he emerged. There was no attack, no threat, nor had there been for all the time we had been with him over four days. I kept reminding our impatient guide, eager to return to the Lodge, to slow down and to wait. It was 7:30 and we were an hour late and tired. It was difficult to contain all the energies and stay parallel or behind the Great Elephant so that he could lead. 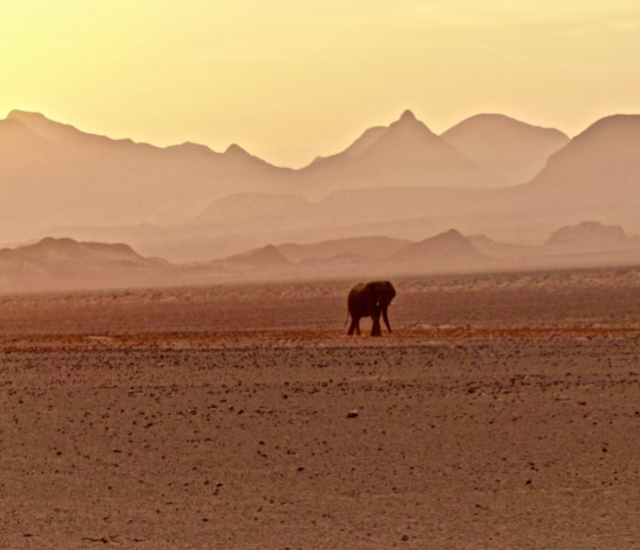 The Great Elephant came to the stony edge of the slope where the wide plain of the desert opened before us. He stopped. He pissed and defecated again. Not one of us had ever seen such frequency. Slowly, then, with utter presence, he proceeded up the rise and as he paused to spray himself with dust, he caught the exact and fleeting angle of the ruby light of the setting sun. Then he went on, his footsteps, mysteriously filling with a sourceless light. The Great Elephant looked back at us one last time. An Elephant Ambassador came to meet us on January 6th, 2000, Epiphany. Now again, at the very last hour of the very last day, another such meeting. A spirit? A messenger? An angel? In the presence of the Great Mystery, it is best to remain wordless. Deena Metzger has been writing for fifty years. Story is her medicine. Her latest novel, A Rain of Night Birds, a confrontation between indigenous knowledge and the modern scientific mind, bears witness: climate change arises from the same colonial mind that enacted genocide on the Native people of this country. It was published on Earth Day, April 22, 2017. Her other books include the novels La Negra y Blanca (2012 PEN Oakland Josephine Miles Award for Excellence in Literature), Feral; Ruin and Beauty: New and Selected Poems; Doors: A Fiction for Jazz Horn; Entering the Ghost River: Meditations on the Theory and Practice of Healing and Tree: Essays and Pieces. Living in the San Jacinto mountains these past 17 years, surrounded by the beauty of nature, my communication has always been (since I was a little girl) an intuitive ease with and appreciation for the green world. Going back to Joy Harjo’s poem, Deena, when I think of you, I see and feel your presence as an “alive poem” and continue to be grateful for the time we shared so many years ago. Thank you dear Bronwyn for such a response that does what matters so, takes the conversation, further and deeper. Toni’s work is essential to our consciousness of animal intelligence and agency. Increasingly, I understand that any saving of the planet will occur working with and allying with the animals. These experiences with the Elephant People confirm this. I am so glad you got to be in the mountains. May they be protected and you be strengthened by being together. Grateful back to you for our past. What I always remember, and have followed myself, is the candle that was always burning in your house when I entered it. And so, now, in front of me, a candle burning. And I always think of you when I light it each day.